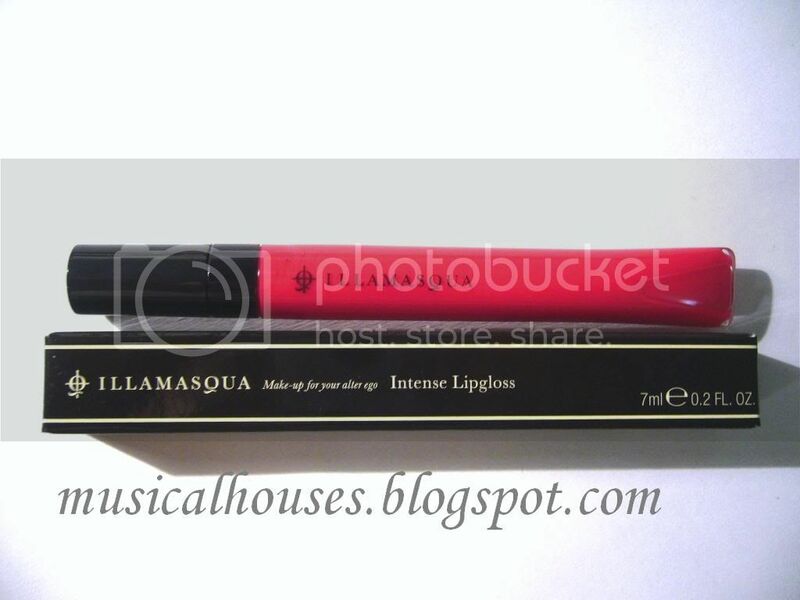 GIVEAWAY: Win an Illamasqua Intense Lipgloss in Petulant! So what exactly is the dealie? That's a photograph of the lipgloss. Isn't it beautiful? I mean, I'd keep this for myself and say it's a birthday present from me to me, but hey, what better way to celebrate my birthday than by giving away something to the loyal people who have supported me all the way! Awesome! What can I do to enter? Easy! Do both the below steps, and you'll get one entry! 2. Leave a comment on this post, telling me why you want to win! Don't forget to include your email address so I can contact you if you win! A winner will be randomly chosen from the pool of entries received, and contacted via email and on their blog/twitter (if they have one). That was too easy! Anything I can do to give myself additional entries? 1. Follow me on twitter (link HERE) and retweet this message "RT @musicalhouses Follow @musicalhouses and RT to win an Illamasqua lipgloss in Petulant! Details http://bit.ly/74Sh1w"
2. Add my blog to your blogroll. Don't forget to leave a comment with a link to your blog so I'll know to add your extra entry! Post about this giveaway on your blog with a link to this entry (link to entry HERE), and comment on this post to tell me about it, so I'll know to give you an extra entry! Don't forget to link back to your blog entry in which you talked about this giveaway! So altogether you get 5 chances to enter this giveaway - 1) Following and commenting, 2)Following on Twitter and retweeting, 3)Adding my blog to your blogroll and 4)Posting about this giveaway with a link on your blog (for 2 chances). Not bad eh? I'm a huge procrastinator. How long do I have to procrastinate before I start on this? I'm an international reader. Can I still enter? This giveaway is open to both local and international readers! As long as you're not on the moon or somewhere Royal Mail can't reach you, or in a country where these types of things are illegal, you're in! Ohhh lovely! I'd love to win that since I always end up buying neutral lippes for myself even though I love color. P.S. Congrats on 50+ and Happy Birthday! I want to win because I've never tried any product from Illamasqua before. I have been working pretty hard this winter to keep my lips moisturized and not cracked (the rest of my face, though, isn't as lucky due to the impracticality of slathering the face with vaseline every night hehe). To reward myself, I am wearing lipgloss ALL the time! Illamasqua has some very good reviews and I'd love to try it! How cool! Can I enter? I have only tried one Illamasqua product - Muse nail polish and would love to try their lip gloss!! thanks for the comment luv :) i NEED this lipgloss in my life because that color is like nothing i've seen before. and i promise you i'll rock it out! I love lip gloss, i love illamasqua and i love that color! happy birthday hun! thanks for the sweet comment on my cupcake post. congrats on ur growing followers! I've been following for a little while now and just added you to my blogroll (http://www.strawberrymochi.com) & twitter feed (mochistrawberry). Great! I just discovered your blog which is very cool! Sorry for my english is not top (I'm french). I would like to participate in your giveaway because I dot nor know this brand but this gloss looks beautiful! I wish you a very happy Birthday! Oh very nice give away! I'd love to try this out for a review on my blog! :)))) Always searching for new glosses! Hi! I would love to win because I love lipglosses and the colour looks fantastic! Yay I'd love to be entered! I would love to win this because Illamasqua is unavailable in New Zealand :( But it looks so pretty and I want to try it so much! Thanks for stopping by my bloggy +^~^! I'm a new follower of yours! Hi, I couldn't pass this super cute giveaway, it's awesome to share the celebration of your birthday with us, I love lipglosses and this one is so pretty! Thank you so much for offering such an awesome giveaway! I wanna win 'cuz I've never tried the brand, and it looks uber pretty! I am yet an avid Illamasqua fan but I've been swaying towards their section in Sephora lately and I'd love to try one of their lipglosses-- I'm loving their lipsticks already. Congrats on your number of followers! Well, petulant describes my attitude at times (but I always apologize for it afterward), and I love everything British, including their makeup brands! Hmn, so is there a way to say why you want this without making it sound like a 'oh pitty me' story? :D But I will tell the truth. I believe that having this lipgloss would be valuable in my basket of lippies. Iam a follower and i would love to try this product because i never tried anything from this brand and i absolutly adore liplosses. I follow (follower name is Damla). I'd like to win, because it looks very beautiful and I'd love to try it! Happy Birthday and congrats on the followers which have grown yet again. Please add me I love the shade of the lipgloss, great name for pouting _ Petulant. Wow that's such a beautiful color. I'm a new follower and I added you to my blogroll. Enter me please. i really loved that color!!! i would like to win because i really want to try illamasqua brand! Hi! I am a follower! Congrats on getting so much followers! I want to win because I have never used products from this blog before. I want to win because i haven't won anything before. hi! i'd like to win because i have not tried lipglosses by Illamasqua and the hot red pink looks gorgeous! HIII my name is sofia my email is my.mail.sofia@gmail.com and I need this ! This is soooo preetty !!! oh what a great giveaway! I'm entering too, okay? I am a follower!I am a lipgloss addict!!! I want to win bc I LOVE lip gloss! It's my obsession. I love the shininess it gives to the lips and this looks like a great color to add to my collection! That color is so gorgeous! I adore Illamasqua. Their lipstick is awesome and I want to try more of their products, so I'd love to win this pretty pink color gloss that you're giving away, it would be perfect for the Spring season! :) Thanks! I follow your blog now too. I want to win 'cause I'm a total lip gloss junkie but I've never tried Illamasqua before. I stick to cheapie drugstore brands so Illamasqua lip gloss would be a real treat! Your blog is in my blogroll (on my blog's sidebar). I follow with GFC and I want to win the lipgloss because it would look gorgeous on me! I want to win this lipgloss because I love the color and lipgloss in general!